Find the perfect teacher or instructor in Doerr-Steindorf for private saxophone lessons in your home or in their studio. Check out some of our most popular teachers near Doerr-Steindorf including Sunnyvale, Palo Alto, Mountain View, Santa Clara and Los Altos. Learn about rhythm, melody, harmony, and dynamics, and how they apply to the saxophone. Explore the range of your instrument through various scales. Build solid skills through understanding the mechanics of how your body and instrument work together. Experienced and trained saxophonist ready to help you learn to play and love the saxophone! Hi! I am originally from Auburn, Alabama (War Eagle! ); I moved to Baton Rouge to study music at Louisiana State University (Geaux Tigers!) for four years. After graduation, I decided to move back home to Auburn to share my love of music and pursue a degree in Civil Engineering, my other love. I graduated from Auburn University in December of 2018 with a Bachelors of Civil Engineering and moved to Florida to start my engineering life. I love teaching almost as much as I love playing music and solving problems. Let me help you master these subjects and learn to appreciate them as much as I do! where you're going! I will tailor our lessons around your goals, and make sure you have a great time learning! I have played and taught classical, big band, and jazz styles. I am an engineering graduate with both classroom and field experience applying the subject of mathematics. My daughter is feeling more confident, and this makes a big difference. very easy to relate to, very understanding and helpful! 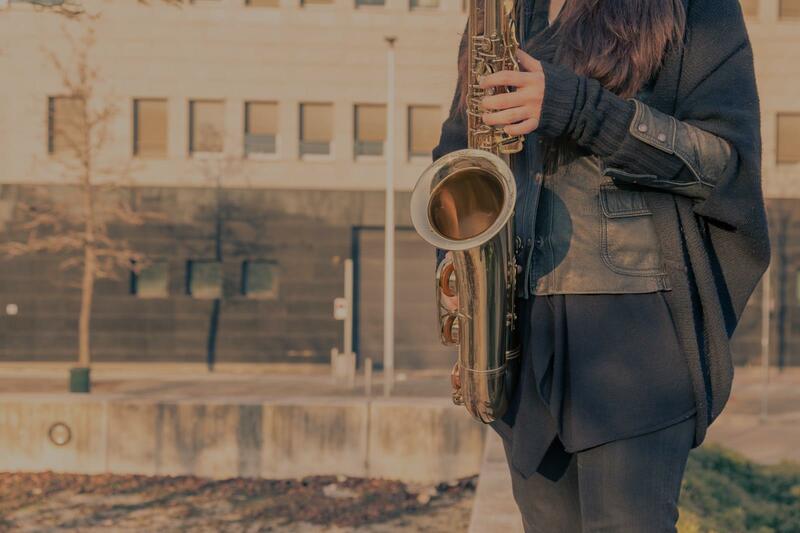 I currently teach alto and tenor saxophone at the New School for Leadership and the Arts, but I have many years' experience teaching music to students of all ages. I teach to the abilities, passions, and ambitions of the student(s). I have played saxophone since I was in 5th grade. I have been in a variety of groups over the years; rock, funk, punk, jazz quartets and big-band jazz, and the experimental use of electronics. You will learn proper breath (dynamics) and embouchure control, tonguing techniques, standard and alternate fingerings, approaches to improvisation and assistance with a varied repertoire for performance. I own a 1967 Beuscher alto saxophone and an Elkhart C-tenor saxophone. My home studio has recording capability which I use to record lessons when they are needed for review. Ear training is a crucial part to music on any level, and I encourage playing by ear as an important element to improvisation and music appreciation. My lessons are fun, informative, and creative! Whether you want to pursue a Musical Career or simply learn how to Play your Favorite Tunes for friends and family, I am here as your Teacher and Guide. I teach at my own home, at the Student's home or through the use of Skype. I recently moved to Detroit. I am originally from Ann Arbor. I spent much of this century living in NYC and prior to that I lived in Chicago. Those experiences vastly helped me develop Networking, Performance and Teaching experience. cts not directly related to the arts such as Mathematics and Science. One of the most important aspects of playing Music is being able to Play by Ear. This has been a priceless gift that I have developed throughout my life and I encourage all musicians, young and old, to do the same. The use of simple Rhythmic Dictation and Ear Training exercises can do wonders for "picking out" Beats and Harmonies no matter what Genre we are interested in. I attended music courses at The Boston School of Contemporary Music, Thomas Jefferson College (MI), and have a BA double majoring in Music Composition and English at Columbia College Chicago. I have toured internationally as a Guitarist and Saxophonist. I am also a Songwriter. THIRD BORDER's "Sun of Water; Sea of Light" was selected to be nominated for the Grammy's as The Best Alternative Album of the Year in 2006. On this record, I played Guitar, Saxophone, sang Lead Vocal and wrote all Songs on that CD. So, if you are a Songwriter, we can polish up your approach! As a Composer, I have done Sound Design for Film, Dance, Spoken Word and Multi-media Performance - most notably with renowned poet Anne Carson and former members of The Merce Cunningham Dance Co.
My teaching style is relaxed with a forte on Patience and Encouragement. Though I have specific expectations on what needs to be learned, I gear each lesson towards the student's wishes and their personal direction in Creativity. Whether you are a beginner or an advanced student, I can guide you wherever you are headed! For Guitar (acoustic or electric), you will learn the fundamentals of Music Theory, Chord Structure, varied Strumming and Picking Techniques, and Scale Positions to travel from one part of the neck to the other. Any song you wish to learn, I can teach! For Saxophone, you will learn proper Embouchure technique, Notation, Music Theory, and Scale Patterns for improvisation. Whether you are interested in a Classical, Blues, Funk or Jazz approach, I can help you find your own sound that is both personal and professional. I teach 2nd year Piano and Drums/Percussion directing you into Intermediate level. For those leaning toward the experimental genres, I am well-versed in the use of Electronics. Much can be accomplished with my lessons on Sound-Scape Improvisation either as 1 on 1 or Group Workshops. At Home Studio: music stands, metronome, guitar amps, electric and acoustic guitars, guitar tablature, staff music paper, a scanner for weekly homework. I can also record and send MP3s of our lessons to review at home if you wish. I am fluent in Rock genres, Blues, Beginning Jazz, Beginning Classical technique, Prepared Guitar, Electronics/Sound Art. 30 lessons for my high school son with Ben. Excellent teacher. Always on time. Very professional. Baritone Sax. Highly recomend. Will be getting more lessons with Ben. I am extremely excited about taking lessons! Even more so excited about my decision to have Benjamin as my Instructor. He has a natural teaching ability- making it easy for a student to grasp the lesson. We will go through a method book to go through the fundamentals of playing sax and will supplement it with ear training and music theory. We will learn any song that you want to! From a TV show, video game, movie, or anything else as it is very important to have fun with what you are playing. We will play duets and have a great time while becoming a better musician! This is my primary instrument and the one I am the most excited about. I've been teaching saxophone for a year and my students have gone on to perform in area-all-state competitions and concerts in the NY area. Within the first few lessons, you'll be able to play a few folk songs and as time goes on you'll be able to read treble clef. I specialize in classical, typically use Rubank or Jump Right In books, and have the following tools available for your lessons: metronome, and laptop. I love working with students of all ages and experience levels and I can't wait to meet you! As a concert saxophonist, Jonathan has performed around the country with repertoire from composers such as J. S. Bach, Handel, Mozart, Ibert and von Koch. Whether a beginner or a progressing student of the saxophone, Jonathan's students receive personalized instruction based on their needs and goals. Students are encouraged to excel in areas including technical proficiency, articulation, tone imagination, tone color, and music theory. Students who have never played an instrument will learn how to read music, write their own exercises, and effectively practice. A newcomer to the Bay Area, Johnny is an active music student and performing concert saxophonist. He holds the chair of Alto Saxophonist in the Zēlos Saxophone Quartet, an actively performing chamber ensemble, as well as first chair Alto Saxophone in the SJSU Wind Ensemble. Johnny’s beginner students learn the basics of music theory as well as the basics of the saxophone. New students can expect to learn how to properly assemble a saxophone and play a tune in the first lesson. More advance students, such as those in middle/high school, will learn the essentials of musicality and begin learning standard repertoire. All students are expected to practice and prepare a minimum amount for each lesson in order to progress. Johnny will work with students based on their needs, and will help solve any problems they may face. received several awards, including the grand prize for the 2017 San Jose Music Study Club Competition and first-place for the 2017-18 MTNA State/Regional Chamber Ensemble Competitions with the Zēlos Quartet. I have played Alto Saxophone for 12 years. In marching band, jazz band, and concert band. Passionate about teaching ASL to everybody!! Weather you're a business owner looking to expand your communication boundaries, or a parent learning to help communicate with a child, or even a child, who is HOH/ deaf, or has friends who are deaf and want to communicate better with them, I am your gal!! I also have extended experience in helping nonverbal children communicate using sign in the world of special education..I am flexible, and I love teaching/signing. Welcome to the world of singing, it's a glorious art! "We feel very fortunate to have found Robin. She is a wonderful and very talented teacher." San Jose, CA teacher: Robin L.
"Great teacher, very nice person!" to understand where the student is and what is best to focus on. She comes prepared and is enthusiastic. She is especially good teaching children. I have seen her in action teaching beginner piano, beginner clarinet, and beginner/intermediate sax."